Daniel Eakins is astonished to discover his recently deceased Uncle Jim has left him time machine in the form a of a time belt. Exploring the unlimited possibilities of time travel Danny soon discovers he is not alone in the universe as he meets his future and past selves all travelling in time. 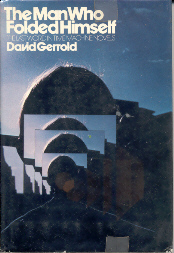 David Gerrold's The Man Who Folded Himself is one of the defining works in time travel literature. Gerrold explores the ramifications of time travel from every angle. Not shying away from paradoxes or alternate universes, Gerrold makes the effort to explore the nature of time travel and the practical aspects of travelling through time from his protagonist's perspective. Throughout the novel Gerrold presents a well thought out treatise on time travel, defining concepts from tangling, the act of doubling back on your own time line, to excising, the act of undoing an unwanted action by travelling back in time. These concepts are well thought out and demonstrated in the course of the story as Danny Eakins travels through time. Gerrold's ability to explain his concepts in simple terms is second only to Jack Finney's grasp of time travel as demonstrated in such works as Finney's About Time [Short Stories] and his classic Time and Again . What makes The Man Who Folded Himself a classic is not only Gerrold's thoughts on time travel, but rather his ability to weave the elements into a meaningful exploration of personal identity as Danny tries to come to terms with his own individuality and sexuality. Out of print for many years, The Man Who Folded Himself was recently reprinted by BenBella Books with an introduction from Canadian SF writer Robert Sawyer. One word of caution, the reprinted edition has had minor revisions that seem to be limited to updating the novel with modern references, such as CDs in place of LPs. Gerrold is perhaps best known for his contributions to the Star Trek genre, namely writing the award winning script to "The Trouble with Tribbles" for the Original Star Trek series when he was just 23 years-old. Gerrold has also written a number of other novels [Internet Speculative Fiction DataBase - Bibliography], movie/tv novelizations (Battle For the Planet of the Apes & Encounter at Farpoint) , as well as television scripts for such series as The Twilight Zone , Sliders  & Land of the Lost .